I adapted a cultural post I put up a year ago. Why? Because I think I have some new readers since last year and it's the season right now! And this is important! Strawberry season in Poland? Important? Yes it is! Very important! Just ask my husband! Poland has a big and healthy strawberry crop every year. The home grown strawberries are delicious and plentiful. We know they are in full season when they are sold, not in the store, but everyone you look - outside. The berries are big and beautiful! and this year we're paying between 5-7 zl/kilogram for them - so one of these baskets is about $3.83 in USD if they are big - but that depends on the day. We are coming in to peak season right now since it is so hot. That means that they will be plentiful for a short while but over quickly! This box holds 2 kilograms or about 4.5 lbs. You pay a deposit for the box if you want to and then next time you buy some, you just trade your box for the next box - and at the end of the season you can turn your last box in and get your small deposit back (2 zl, I think - about $0.60 USD). 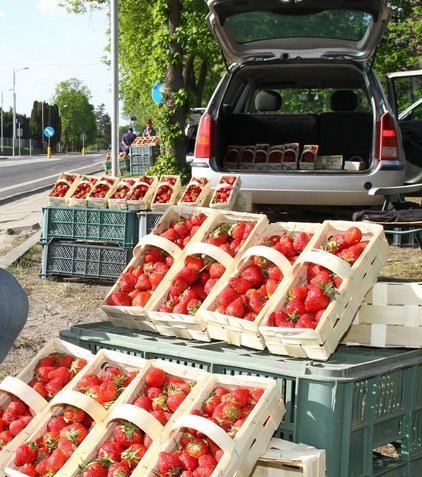 Usually strawberry season in Poland starts towards the end of May and goes into June - and we continue to have fresh strawberries then until the end of June or the beginning of July. It all depends on the weather. If it gets too hot too fast or we have too much rain, then the season is shortened. picture taken from google images - I don't know whose strawberries these are, but this is a typical site in Poland during the season. People pretty much part wherever they can and open their trunks or side doors and set out their berries and sell! And so I have. Now we have it with our strawberries. It is ever so much more tasty than Cool Whip! Be sure to check out what my sis has for you in the store! She's always trying to add things so you have something to buy as she tries to help you stretch your fabric dollars!